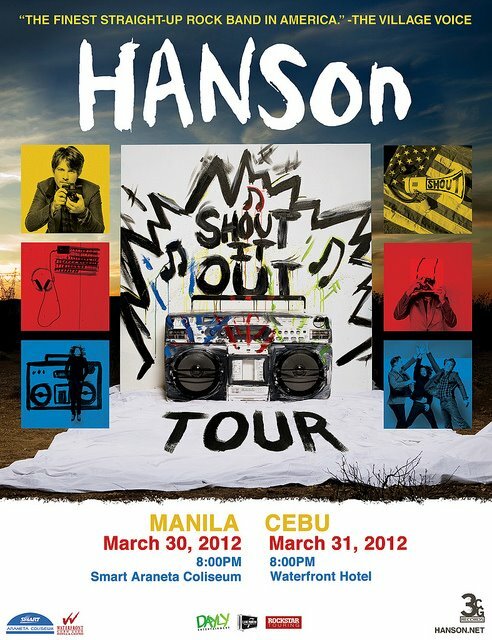 Catch Hanson Live Concert in Manila on March 30, 2012 at the Smart Araneta Coliseum and Hanson Live in Cebu on March 31, 2012 at Waterfront Hotel Cebu. The American pop band will be performing live at the Smart Araneta Coliseum in Manila on March 30, 2012 and at the Waterfront Hotel and Casino in Cebu on March 31, 2012. The concerts are part of the band's "Shout It Out World Tour." Composed of Hanson brothers Isaac, Taylor, and Zac, the band rose to fame after the release of their 1997 hit song "MMMBop" which was nominated twice at the 1998 Grammy Awards and by far the band's most successful single.